UGC net admits card is now available to download for who have applied for appearing in the examination. A large number of aspirants who wish to get taught in college as an Assistant Professor or want to become a Junior Research Fellowship have applied for it. According to the new notification of NTA (National Test Agency), UGC NET exam is going to conduct on 18th December to 22nd December 2018. NAT will conduct NET Exam in Two Shifts one shift will start from 09:30 AM to 01:00 PM and Second Shift will start from 02:30 PM to 06:00 PM. Aspirants who have to appear in the exam can visit the official website of NAT for Download & appear in the UGC NET Exam 2018. A large number of aspirants want to search out NET 2018 Exam Date, Exam date of UGC NET Date, National Eligibility Test Dates. Here on this web page we first would like to update your date exam will be conducted in 2 shifts and 5 days UGC Exam Date is following. Aspirants require to download the UGC NET 2018 Admit Card for knowing their exam dates and exam time. As UGC NET 2018 will be the first exam which will be conducted by NTA, It is newly organisation which is organised for the all national level test for the entrance examination in the various courses and other hi-level entrance tests. Earlier this work was conducted by CBSE. NTA will be decided and prepare the merit list for Assistant professor post and it will be also granted Junior Research Fellowship. Admit Card of NET Examination 2018 can give completed information to the aspirants for their exam date, Exam time as well venue with roll number and other important information related to participating in the UGC NET 2018. Aspirants are suggested to download their NET 2018 Admit Card and get completed detail, Admit Card of NET 2018 download procedure and Download link has been instructed on this website. before it one overview. On behalf of UGC, the National Eligibility Test (NET) is conducted for determining the eligibility of Indian nationals ‘only for Assistant Professor’ or ‘for Junior Research Fellowship and Assistant Professor both’ in Indian Universities and Colleges. Till recently, the CBSE conducted the UGC-NET in 84 subjects at 91 selected cities spread across the country. From Dec 2018 onwards, the UGC-NET will be conducted by the National Testing Agency (NTA). Then click on Login & Dashboard will be open. 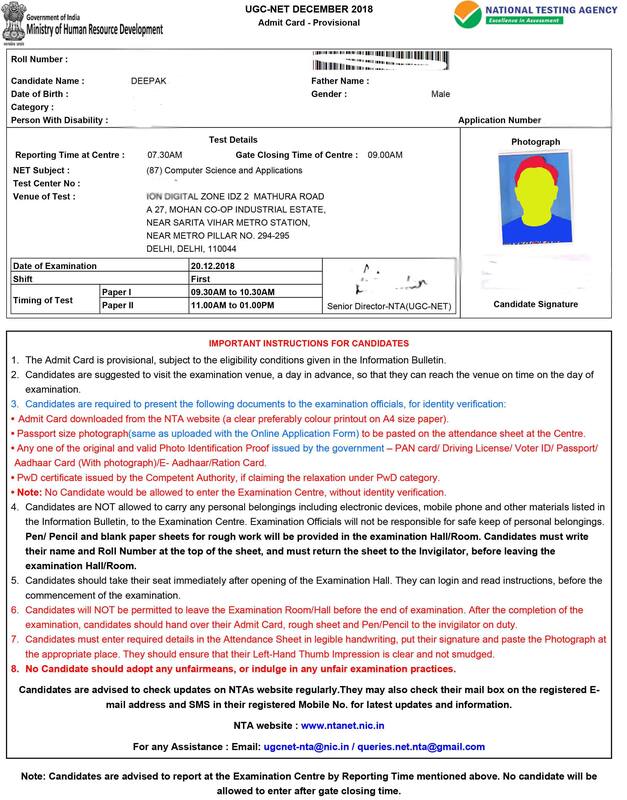 Click on Download Admit Card, It will be shown and click save the download.